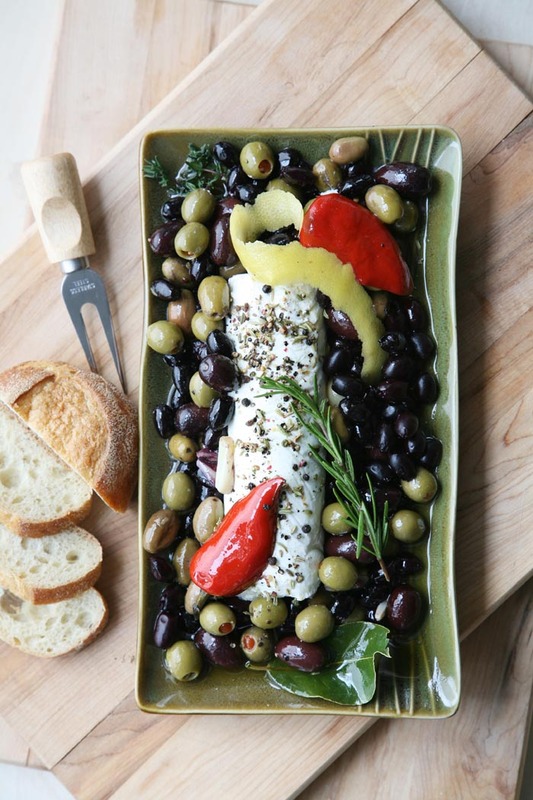 If you show up at my door unexpected, and plan to stay for a while, you’ll be served warm marinated olives. Tucked in the side compartment of the fridge, right between the mustard and pickles, you’ll find a Mason jar full of olives in flavoured oil. I’ll grab a small saucepan and tip the olives into the saucepan to warm them to bring on their full flavour. If you’re lucky, I’ll have chèvre, goat cheese, on hand and I’ll drizzle a bit of the marinated oil over the cheese and then add some freshly cracked black pepper. It will be casual and effortless and you’ll never know I’ve been hoping for an unexpected guest. Place the olive marinade ingredients in a medium saucepan and warm over low heat until aromatic, approximately 30 to 40 minutes. Place the goat cheese in the center of a small platter and surround it with the marinated olives. Pour the oil and crushed herbs over the cheese. Garnish the platter with the marinated peppers, lemon peel and rosemary. Serve with a baguette or crackers. *The oil marinade should not be warm enough to melt the cheese. 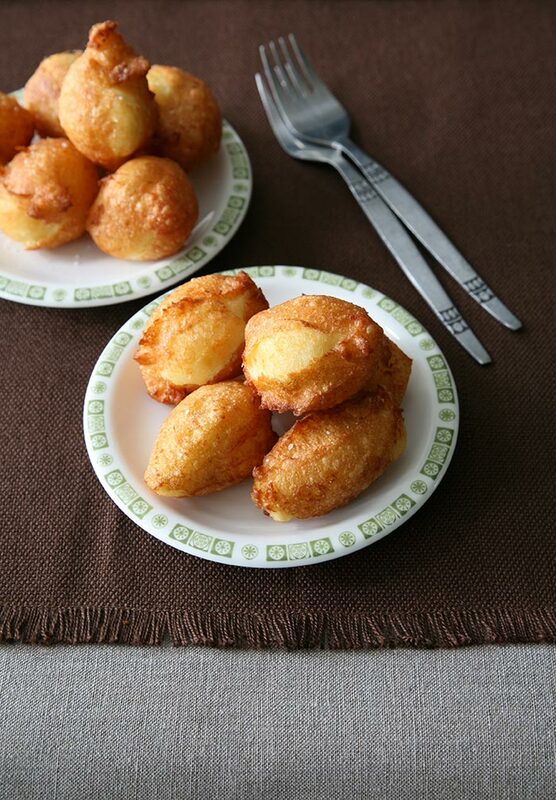 Pommes Dauphine is just a fancy way of saying potato fritters. Except these are no ordinary fritters. This is what you get when you combine mashed potatoes with choux pasty, the very dough that gives us gougères and éclairs and all sorts of wonderful French pastries. The dough is fashioned into a little oval dumplings, using two spoons, and deep-fried until golden. Making them is easy. Resisting them is not. Inspired by a recipe for Cream Puff Potatoes found in Jacques Pepin’s Complete Techniques. While the potatoes are cooking, combine the water, milk, butter, salt and sugar in a medium-sized saucepan. Bring the mixture to a full boil. Remove from the heat and add the flour all at once and stir vigorously with a wooden spoon until the mixture forms a ball and pulls away from the sides of the pan. If using a stand-up mixer, transfer the dough to the mixer fitted with the paddle attachment. If mixing by hand, use a wooden spoon. Add the eggs to the dough, one at a time, ensuring each egg is well incorporated before adding another. The mixture is ready when the dough forms a thick ribbon from your paddle or spoon. If the mixture is too firm, add an additional egg. Add the mashed potatoes and combine with a wooden spoon. Season with salt and pepper to taste. Pour into a deep saucepan at least four inches of oil. Heat the oil until an instant-read thermometer reaches 350 degrees. If you don’t have a thermometer, test the oil by adding a small cube of bread: if the bread sizzles and turns golden in about a minute, the oil is ready. It takes a bit of practice to form the mixture into perfect quenelles, or small oval shapes, but once you’ve made a few you’ll get the hang of it. Take a generous spoonful of dough with one spoon and, in your other hand hold an identical spoon. Holding the spoons vertically and close to the scoop end (rather than the handle end), alternate the mixture from spoon to spoon, following the contour of the spoon as you transfer the dough back and forth until the mixture is smooth and oval shaped. Carefully lower the quenelles, one at a time, into the hot fat, being mindful not to crowd the pan. 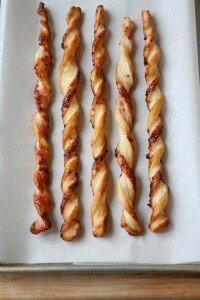 Fry until golden brown, about 3 to 4 minutes, turning them occasionally to ensure they are evenly coloured. Remove with a slotted spoon and transfer to a wire rack lined with paper towel. Sprinkle with salt while still warm. Serve immediately. Mushrooms aren’t terribly exciting until they’ve had a few glugs of chicken stock and a glass of wine. Once the wine hits, they go from a nice, polite, back-drop kind of vegetable to a rich fungi with serious swag. I know you’ve read this before, but it’s worth repeating, especially when it comes to mushrooms: Do Not Crowd The Pan. I know, it’s faster to dump the mushrooms in the pan all at once, but if you do, you’ll have pale, wimpy mushrooms steamed in their own juices. If you’re patient and let the mushrooms take on colour, without poking and prodding them relentlessly, they’ll reward you with a rich brown base, or fond, which colours your pan and provides a great deal of flavour when rescued, or deglazed, with a good splash of wine. You’ll enjoy these mushrooms with steak, omelettes, roasted chicken, pasta and just about everything else imaginable. 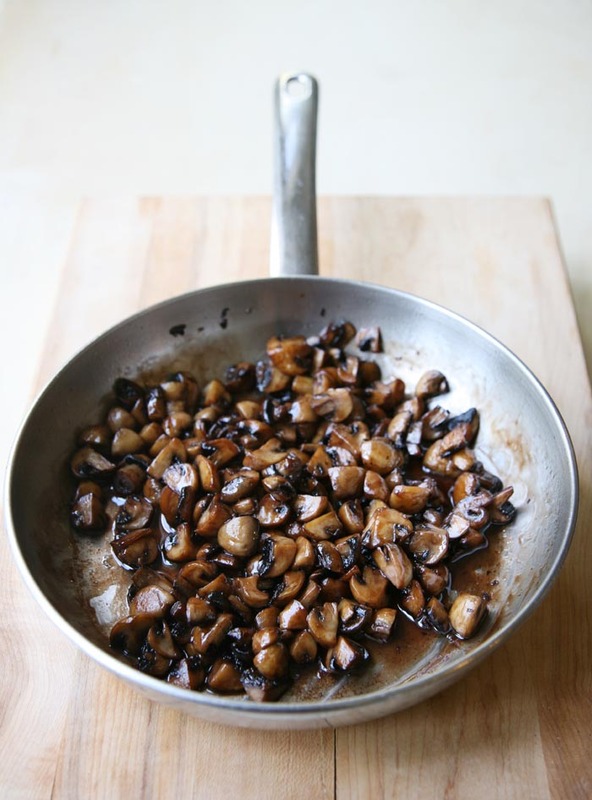 If you’re serving roasted or seared meat, be sure to add any pan juices to the mushrooms. If you like mushrooms with a silky finish, adding a splash of whipping cream will add richness and a mellow je ne said quois. Before you start, place a strainer over a bowl, as pictured, to drain any excess butter from your sautéed shallots and mushrooms. In a medium saucepan, melt about 1 tablespoon of butter and sauté the shallots until soft and translucent, about 5 to 6 minutes. Place the shallots in the strainer to drain them of excess butter, then place them in a clean bowl. In the same saucepan in which the shallots were cooked, melt another tablespoon of butter and add only enough mushrooms to fit in the pan. Allow the mushrooms to take on a bit of colour before stirring them and turning them to brown on all sides. When the mushrooms are golden brown, place them in the strainer, to drain them of excess butter. Then place them in the bowl with the shallots. Remove the golden fond from the bottom of the saucepan with a splash of wine. Pour this into the bowl with the shallots and mushrooms. Continue cooking the mushrooms in batches, deglazing the pan between each batch with a splash of wine. When all the mushrooms have been cooked, return them ALL to the saucepan, along with the shallots. Now that they’ve browned, and lost some of their bulk, they don’t mind the over-crowding. If you have any wine remaining, add it to the mushrooms and turn up the heat, high until the wine is all but evaporated. Add the chicken stock and allow it to boil until it’s almost evaporated. Season the mushrooms generously with Kosher salt, about 1/2 teaspoon, more or less depending on the seasoning of your chicken stock. If you’re serving this with meat, add any pan drippings from the meat. If you like creamy mushrooms, add a splash of whipping cream. Just in time for Easter, this delicate Charlotte is perfect for ushering in the spring. If you’ve the stamina to create a layered cake, then you’ve got what it takes to make a Charlotte. With a little patience, and a pastry bag, you can create a dessert worthy of a French Patisserie. And, if you’re short on patience, you can forgo the lady fingers and whip up the raspberry mousse instead. What better way to use the last of the summer’s frozen berries? 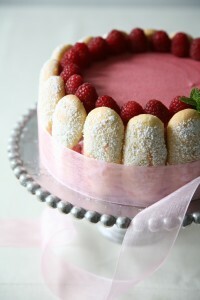 The Charlotte consists of an easy sponge cake, the “ladyfinger” exterior, and a sweet and tangy raspberry mousse filling. If you’ve never had homemade ladyfingers before you’ll be surprised to discover they are soft and cake-like; nothing like the store-bought ones in the cello packages. To understand the assembly of the cake, read the recipe through to the end before you start. Like you always do. A pastry bag with a round nozzle tip approximately ½” to ¾” in diameter. The larger the nozzle, the bigger the ladyfingers. A round stainless steel ring mold, 8” diameter x 2 ½” height. If you can’t find the exact size, the recipe can be easily adapted to any size mold; simply adjust the size of the ladyfingers accordingly. Leftover mousse can be piped into small sherry glasses and served with fruit. A cardboard cake round, 8” diameter. You can buy cardboard cake rounds from craft stores or cake decorating stores, but I make my own from recycled cardboard. I use my ring mold to trace the template onto the cardboard, and then I cover the cardboard with plastic wrap. It doesn’t have to look pretty, it will be discarded later. If you have a kitchen scale, use it. I’ve provided imperial measurements but I prefer the accuracy of grams, especially when baking. A beautiful cake platter (to show off your creation). Line two baking trays with parchment or a non-stick liner, such as Silpat. Place the ring mold on top of one of the lined trays. In a large bowl, combine egg whites and a pinch of cream of tartar. With a hand-held or stand-up mixer, whip the egg whites for a few minutes at medium-low speed. 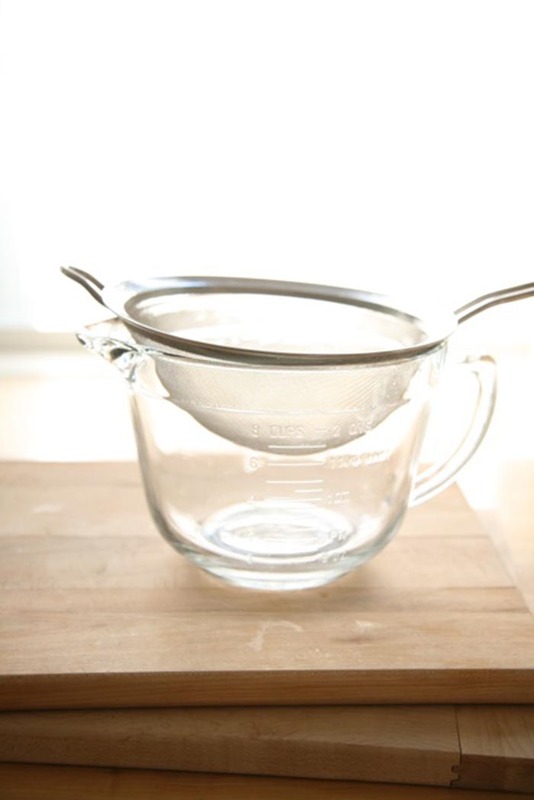 Don’t rush this process as whisking egg whites too quickly will produce unstable egg whites that can deflate easily. Gradually add approximately half of the sugar, increasing the speed to high just until you have a firm peak. Over-whipping the egg whites can turn beautifully glossy, frothy egg whites into a curdled mess. Add the balance of the sugar to the eggs yolk and whisk until the yolks turn a pale yellow. You can do this by hand or by mixer. Gently fold the yolk mixture into the meringue, until well incorporated. Then fold in the flour until it is well incorporated. You should have a light, smooth batter. Don’t be concerned if the batter is somewhat loose. It should puff up, once it’s in the oven. The mixture is now ready to scoop into a piping bag. You will find it easier to manage a piping bag if you have a narrow canister or large-mouthed glass that will hold the piping bag in place while you fill it. Simply tuck the bag into the container, tip down and roll the large end of the bag over the edge of the canister or glass. Do not overfill it. Fill the ring mold (on the lined-baking tray), with ½” deep batter. It is easy to spread the batter evenly with your piping bag if you start in the middle and pipe a thick spiral to the edge of the mold. Bake for approximately 10 to 12 minutes until golden. Loosen the edges of the cake mold with a knife; carefully remove the cake base from the ring mold and place it on a rack to cool. Using a sifter or a fine-mesh sieve, lightly sprinkle the golden side with powdered sugar. Once the cake is cooled, trim the cake into a 7 ½” round. This will make perfect sense when you assemble the charlotte. 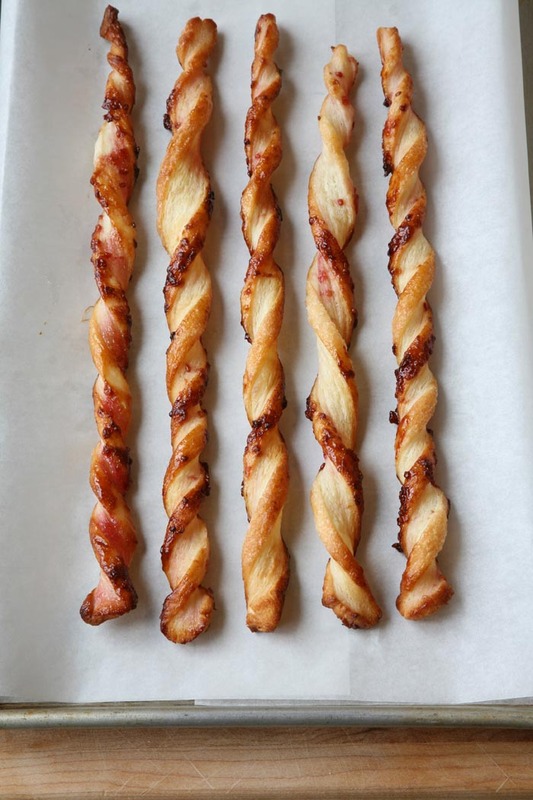 Pipe 4” lengths of batter, approximately ¾” thick onto your lined baking tray, leaving at least ½” between each ladyfinger. Just before baking, lightly sprinkle each ladyfinger with powdered sugar. Bake for approximately 10 – 12 minutes until golden. Carefully remove the ladyfingers from the tray with a spatula and place them on a rack to cool. Place a tray (that will easily fit into your fridge) on your work surface. Now, place the trimmed cake, sugar side down, directly on the centre of the cardboard. You should have a half-inch gap from the cake to the ring mold. Line the inside of the ring (the gap) with the ladyfingers, flat sides facing in. The bottom of the ladyfingers can be trimmed slightly so that they are flat on the bottom. You will want a snug fit. Set aside, loosely covered, until the mousse is ready. In a small saucepan, melt the sugar and the strained puree until the sugar has dissolved. If the berries are tart, you may wish to add more sugar. Add the unflavoured gelatin and mix until well combined. Set aside to cool slightly. Fold in the whipping cream until the mixture is combined. The mixture should be somewhat firm; if it is too runny, it will seep through the ladyfingers and make a mess. If the mixture needs additional firming, place it in the refrigerator for the gelatin to take effect. You want the texture soft enough to pour into the lined mold, but firm enough so that is will hold its shape. If you do place it in the refrigerator, check it every now and then to make sure it has the correct consistency. To remove the mold, place a warm damp cloth on the cold metal ring to warm it, and then carefully lift the mold from the Charlotte. With a cake platter in front of you, lift the charlotte, peel off the cardboard base, and carefully place the cake on the platter. Decorate the top of the cake with fresh raspberries and a sprig of mint. Stand back and admire. Your guests will be duly impressed. Years ago, I made the mistake of bringing homemade puff pastry straws to a local charity event. I had a booth set up for my cooking school and I displayed the pastry straws in vases as you would long-stem roses. Once people got wind of my booth, there was a bit of a frenzy — one elderly gentleman grabbed a vaseful and I had to wrestle it from his hands. 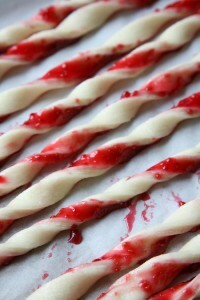 These days, I’m more selective about who gets my pastry straws. You must be family, a close friend, a student, or have connections. Before you start, line a baking sheet with parchment. 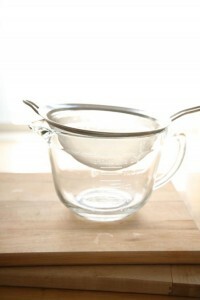 Place another sheet of parchment on your work surface and sprinkle it generously with about 2 heaping tablespoons sugar. Roll the puff pastry dough into a square approximately 14” x 14” (about 1/4” thick) on the sugar-dusted parchment. 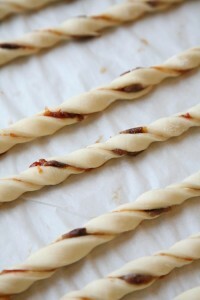 Remove the plastic and, with a sharp knife, cut the pastry into long, 1/2” wide strips. If the pastry is too warm to cut easily, place it in the fridge for 20 minutes to firm the dough. Select one pastry strip at a time, and grasping it from both ends, gently twist the long strip dough in opposite directions, to fashion a spiral. Transfer the pastry spiral to the parchment-lined baking tray and press each end of dough to the rim of the baking tray, to secure it in place. This helps prevent the dough from contracting when it’s baked. Continue with the remaining strips, leaving about 3/4” between strips. Cover the dough with plastic and refrigerate or freeze until ready to bake. Bake the dough, well-chilled, for about 10 – 15 minutes, or until golden, turning them over once during baking to ensure even browning on each side. Sweet or savoury, there’s no limit to what you can sprinkle or spread on puff pastry.